Background: Various parameters of embryo morphology have been routinely used to select the embryo/s with maximum implantation potential during in vitro fertilization (IVF). Hence, there is a dilemma in clinical practice as to which morphological scoring system/test to use. 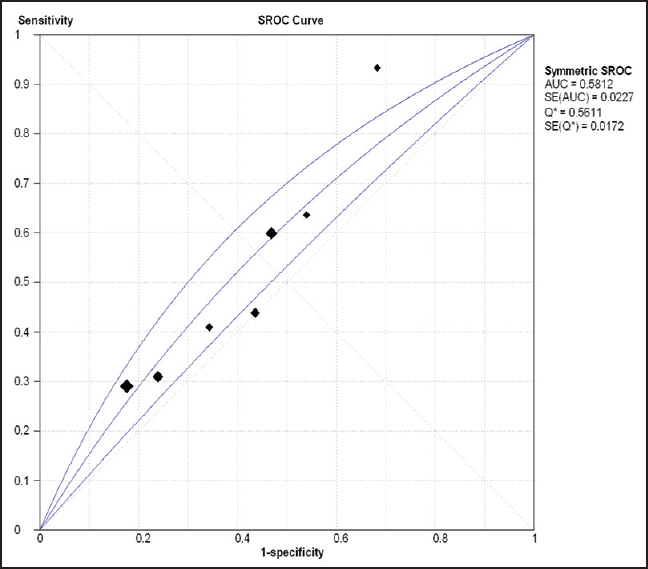 We performed a systemic review to determine the predictive power as well as the clinical and cost-effectiveness of existing morphological tests of embryo quality described in an IVF setting. Materials and Methods: The preferred reporting items for systematic reviews and meta-analyses (PRISMA) guidelines for systematic review were followed. A mixed-method analysis was performed. Qualitative and quantitative techniques were used to synthesize the final results. A narrative summary approach was used for initial data exploration and description, followed by the pooling of data, where appropriate, using Meta-DiSc software. Receiver operating characteristic (ROC) curves were plotted wherever appropriate, and the area under the curve (AUROC) was determined. Results: Day 3, day 5, and early cleavage (EC) all had similar discriminatory value for predicting implantation (AUC 0.66, 067, and 0.63 respectively). There was no evidence of improvement in pregnancy rates due to routinely doing EC. No studies were identified that determined the cost-effectiveness of any of the tests. Conclusions: All tests have low accuracy. They lack the discriminatory power to identify an embryo that will/will not lead to implantation. Appropriately designed studies are required to assess the predictive value and the clinical and cost-effectiveness of novel embryo scoring technologies. Ovarian hyperstimulation syndrome (OHSS) is a potentially serious complication of ovarian stimulation for fertility treatment. Risk factors include polycystic ovaries, high ovarian reserve, and excessive ovarian response to stimulation. It is important to be aware of the risk of OHSS, even in so called "low-risk" situations. An understanding of the pathophysiology of OHSS may help clinicians to target preventative measures in women who are at risk. Ovarian stimulation regimes based on an individualized reserve assessment may help reduce the incidence of OHSS. Gonadotropin-releasing hormone (GnRH) antagonist regimes are associated with a lower risk than GnRH agonist regimes and the risk may be further reduced if a GnRH agonist trigger is used in place of human chorionic gonadotropin (hCG). Other methods of reducing hCG exposure include avoiding hCG luteal support, cryopreservation of all embryos, and avoidance of multiple pregnancy. However, the only method that guarantees avoidance of OHSS in high-response cycles is cycle cancellation. Clinicians should be aware of the potential value of coasting and dopamine agonists, as measures to reduce risk in the presence of an excessive ovarian response. Color Doppler is emerging as a valuable diagnostic imaging modality in the field of reproductive medicine, primarily infertility. Reproductive disorders, including infertility and spontaneous abortions/miscarriages, have emerged as major public health problem(s) worldwide. Color Doppler energy imaging is a high throughput technology based on the total integral of energy frequency spectrum. We extracted the most relevant articles (comprehensive reviews and original research articles) for inclusion in our review by performing a comprehensive literature search using the Pubmed (last accessed on 2015 April 28) scientific database. Color Doppler is a high-throughput, sophisticated imaging technique for the assessment of uterine anomalies, intrauterine pathology, tubal patency, polycystic ovaries, ovarian follicular monitoring, endometrial receptivity, failed and/or ectopic pregnancy, male infertility, and uterine, endometrial, and ovarian vascularity. 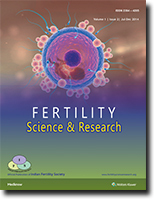 Assessments of the uteroovarian pulsatility indices (PIs), resistance indices (RIs), and endometrial color signals are important determinants of in vitro fertilization (IVF) cycles and pregnancy rates. With our clinical/scientific research experience in the field of reproductive medicine, we strongly believe that an overall public health model needs to be designed in managing infertility patients; therefore, major issues such as cost-effectiveness and technical artifacts should be addressed so as to achieve an accurate clinical diagnosis, successful IVF outcome/pregnancy, and overall patient satisfaction in a clinical research setting. Simple, safe, efficient, and affordable diagnostic modalities should be incorporated at infertility clinics coupled with well-designed patient counseling sessions and community-based public health awareness campaigns conducted so as to reduce the morbidity and mortality rates associated with reproductive disorders. Introduction: Clomiphene citrate (CC) has an important place in therapy for management of ovulatory dysfunction. The objective of the present survey was to understand the knowledge, attitude, and practice (KAP) of Indian gynecologists toward the use of CC. Materials and Methods: A prospective, cross-sectional, observational, questionnaire-based KAP survey conducted among Indian gynecologists. Out of 22 multiple-choice questions (MCQs), 9 questions were related to efficacy, 5 to safety, and 8 to perception about CC usage in routine clinical practice. Data were summarized by percentages in frequency tables and graphs. Results: Seven hundred seventy-one gynecologists in total across India participated in this survey. The majority of the participants preferred CC in treatment of ovulatory dysfunction associated with polycystic ovary syndrome (PCOS). The ovulation rate was reported to vary 21-60% and the pregnancy rate was noticed to be 11-30% by the majority of the participants. CC was reported to have very good to excellent efficacy and tolerability. Resistance to CC was encountered sometimes. Commonly encountered adverse effects included abdominal/pelvic discomfort or pain, ovarian enlargement, and nausea and vomiting. Frequent complications included multiple gestation, ovarian hyperstimulation syndrome (OHSS), and spontaneous abortion. Quite a few doctors reported congenital malformations with CC therapy. A majority of participants preferred CC in a dose of 50-100 mg/day for 5 days starting on the second or third day of the cycle. Most participants advised natural conception to patients receiving CC therapy. Metformin and gonadotropins were the preferred drugs coadministered with CC treatment. Conclusion: The present KAP survey highlighted CC as a commonly used agent for ovulatory dysfunction, with very good to excellent efficacy and tolerability. Objective: To evaluate and compare the effects of letrozole and low-dose gonadotropin combination with clomiphene citrate (CC) and low-dose gonadotropin combination prior to intrauterine insemination (IUI) in patients with unexplained infertility. Design: Prospective, randomized, clinical study. Setting: Academic tertiary institute. Patient(s): A total of 94 patients in the age group of 21-37 years with unexplained infertility were randomized using computer-generated random number table to receive follicle-stimulating hormone (FSH) injection and human menopausal gonadotropin (hMG) injection, along with either letrozole or CC. Intervention(s): All the patients received 150 IU of purified urinary FSH on day 2 of the cycle and from day 3 to day 7 of the cycle 5.0 mg/d of letrozole or 100 mg/d of CC were administered; this was followed by administration of 150 IU of hMG on day 9. Ovulation was triggered with human chorionic gonadotropin (hCG) injection (5,000 IU) when the dominant follicle(s) reached 18 mm in diameter. A single IUI was performed 36 h later. The luteal phase was supplemented with micronized progesterone vaginally. Main Outcome Measure(s): Pregnancy rates and the incidence of multiple pregnancies were our primary outcome. The secondary outcome included the number of dominant follicles, grade of perifollicular blood flow, endometrial thickness, endometrial blood flow pattern, side effects, and complications. Result(s): There were no differences in demographic characteristics between the two groups. Pregnancy occurred in four out of 47 patients (120 cycles) in the letrozole group (pregnancy rate: 8.5% per patient and 3.3% per cycle) and eight out of 47 patients (121 cycles) (pregnancy rate: 17% per patient and 6.6% per cycle) in the CC group; the differences were not statistically significant. None of the regimes resulted in a multiple gestation gestation. The number of follicles per cycle was significantly higher in the CC + gonadotropin group as compared to the letrozole + gonadotropin group (1.77 ± 0.99 vs. 1.39 ± 0.617, P < 0.001). There was no statistically significant difference in perifollicular blood flow, endometrial thickness, and endometrial blood flow pattern between the two groups. No side effects were observed in either group. There was one case of ectopic gestation in the CC group. Conclusion(s): The use of lower dose of gonadotropins and oral agents together resulted in decreased medication costs, lesser monitoring [ultrasound (USG) visits], and good primary and secondary outcomes. However, more randomized controlled trials are needed to prove the efficacy of one regime over the other. The unique case of a young woman with a history of ulcerative colitis and multiple laparotomies is described. She was admitted after oocyte recovery with bilateral lower limb deep vein thrombosis and acute renal insufficiency without convincing evidence of severe ovarian hyperstimulation. This case presented significant diagnostic and therapeutic challenges. It is not possible to quantify the risk of serious complications after in vitro fertilization (IVF) for women with a known medical history. However, it is expected to be above average for at least some of them. Furthermore, management of the arising complications can be problematic in this group. It is recommended that specific measures be taken when these individuals undergo IVF in order to minimize the risk of adverse events. Fibroids of the uterus, the most common benign pelvic tumors in women, as a sole cause of infertility has been debatable, as the incidence of fibroids as the cause of infertility in the absence of other obvious causes has been reported to be just 2-3%. Thus the management of myomas in the setting of infertility has also been controversial. However myomectomy has been considered ideal in a woman with sub fertility because the surgical removal of fibroid has definitely demonstrated improvement in pregnancy rate especially after assisted reproduction. Assisted Reproductive Technologies have resulted in an increase in the incidence of higher order multiple pregnancies which in turn is complicated by increased perinatal morbidity and mortality. Thus embryo reduction is offered to decrease the complication of prematurity and preterm birth due to multiple gestation. 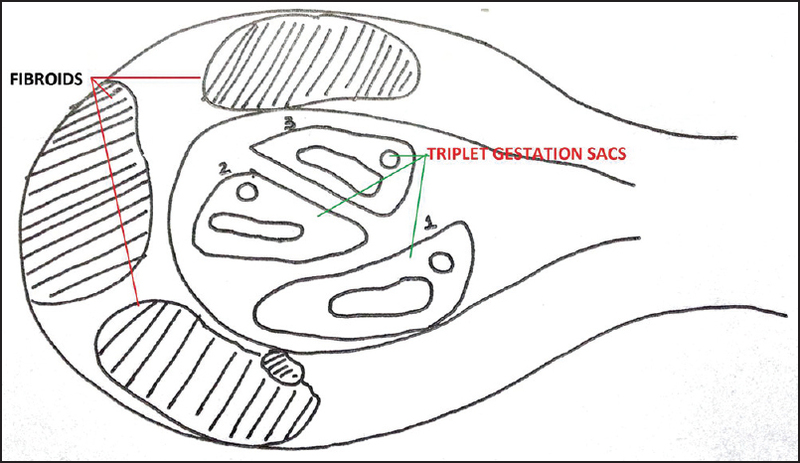 The technique of multifetal pregnancy reduction is not without risks especially in the presence of other pathology like multiple myomas. Herein we present a case of long duration infertility in the presence of multiple fibroids uterus which gets complicated by triplet gestation after IVF. Embryo reduction in the presence of these myomas is is a challenge both to the clinician in terms of the procedure and the patient because of the risks but subsequently has a successful pregnancy outcome. Ovulation is dependent on the presence of a functioning hypothalamic-pituitary-ovarian (HPO) axis. Estimates of chronic anovulation rates range from 6-15% of women during the reproductive years.Potential causes of anovulation are PCOS, hyperprolactinemia,thyroid dysfunction, stress etc. Idiopathic hypogonadotropichypogonadism (IHH) is rare cause of anovulation. Idiopathic hypogonadotropichypogonadism (IHH) is a collection of genetic mutations that result in delay of puberty, infertility, and low gonadotropins.Women with IHH have hypoestrogenism, amenorrhea, and low gonadotropin levels. Ovulation induction is the method for treating anovulatory infertility. For patients with hypogonadotrophichypogonadism, the treatment involves administration of both FSH and LH, while HCG is injected for follicle rupture. Such patients need high dosage and longer duration of stimulation than other patients.